Palestinian children approach a checkpoint in Hebron. Picture by laurawhudson / flickr.com. Some rights reserved. (CC BY-NC 2.0)The restricted right to education, plays an important role especially for future generations. Actors like the EU, which is the major donor of Palestine and Israel’s most important trading partner, plays a crucial role in order to open space for educational initiatives. Its leverage, however, remains unused due to its unwillingness to invoke adequate pressure on the Israeli occupier. The continuing occupation of parts of the Palestinian West Bank by Jewish settlers and Israeli military units influences the social, cultural and economic development of Palestine. The right and access to education are particularly affected by current policies due to their importance and referring to the vulnerability of its stakeholders. Education is considered a crucial component for a self-determined future. Only a functioning and accessible education system can maintain this goal in Palestine. As the main donor to Palestine, the EU finances a number of education and infrastructure projects in the West Bank and should therefore have a well-founded interest in their comprehensive implementation in order to unfold their full impact. As the latter is not the case at present, the question arises, if the EU plays a similar dishonest game as the US, or if its investment actually aims for changes on the ground. As long as no political and economic measures are taken to ensure the implementation of its projects the former seems to be true and huge sums of money continue to bewasted in the desert. The EU provided over €290 million in assistance to Palestine last year, mainly through the PEGASE financial mechanism. It covers wages of the Palestinian Authority, guarantees pension contributions and provides funds for the needs of the poorest and most marginalised sections of the population. In addition, parts of the funds are channelled through UNRWA directly into support for Palestinian refugees. The aim is to promote economic, cultural, scientific and educational matters - inter alia with the aim of improving the educational situation in Palestine. The humanitarian and structural consequences of the current situation in the West Bank are disastrous for the Palestinian education system. EAPPI, a West Bank-based non-governmental organisation, has published reports on the education situation in Palestine in cooperation with various international organisations. OCHA, the United Nations Office for the Coordination of Humanitarian Affairs, claimed the right of education for 1 million Palestinian Children at risk. According to them, access to education was restricted by several factors. Firstly, physical attacks on Palestinian schools are constantly increasing – in 2016, there were over 150 cases of vandalism, military raids, threats and harassment, attacks on students and educational infrastructure or abuses of schools as interrogation and detention areas. In total, 256 education-related violations affecting 30’000 students have been noted. Secondly, Palestinians are banned from building in Zone C of the West Bank, which means that new schools and houses must be built illegally. Such schools or community centres, often partly or fully financed with EU funds, are regularly demolished by the Israeli military. In September 2017, 56 schools in Area C had pending demolitions or stop-work orders. Thirdly, military checkpoints, restricted zones and dangerous areas make it difficult or even impossible for Palestinians to gain access to schools or other educational institutions. 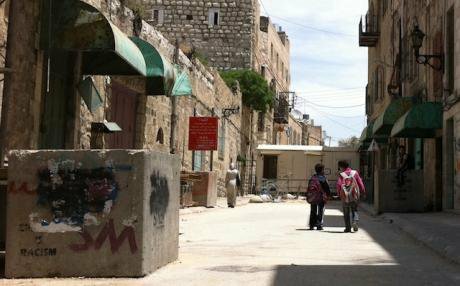 A shocking example is the "Qurduba" school in downtown Hebron, where children and school staff pass two of the West Bank’s most notorious checkpoints on a daily basis. They are regularly threatened and mistreated by the military and the residents of the nearby settlement. These circumstances have a massive impact on every individual and on education as such. Regular delays, psychological consequences for students and employees, as well as violent incidents between various actors in the vicinity of the school are in sharp contrast to a learn-friendly environment. If it wants to be seen as an honest broker, the European Union should counter this situation immediately and sustainably, because Israeli policy is hampering the impact of its support funds and is preventing a positive and independent development of Palestine and its population. There are voices that prognosticate that the EU will act more intensively as a mediator in the Israeli-Palestinian conflict due to the election of Donald Trump. If no tangible and above all better prospects for peace and self-determination can be created, violence will likely continue to dominate everyday life in the West Bank andGaza – such as during the last weeks. This would undermine the EU's pretended role in this and other violent conflicts and would turnthe EU to what the US already is: a dishonest broker, primarily working for its own agenda. Even though several parliaments of EU member states have repeatedly stressed the Palestinians' right to self-determination and the importance of a peaceful settlement of the conflict - not least through the admission of Palestine as a UNESCO member or through a clear vote of the EU parliament– the EU’s policy remains diluted. To be taken seriously, the Union should act in accordance with its resolution adopted in 2014 and actively oppose Netanyahu’s occupation policy in the West Bank, which is extensively pushing ahead the construction of settlements systematically circumventing the Oslo and every other agreement as well as the Palestinian right to self-determination. If wanted, various options for action could be considered to counteract the current situation. Specifically, there would be a choice between increased political pressure on Israel, the creation of new rounds of negotiations, or concrete political and economic measures against Israel and its settlement policy in the West Bank. Official representatives of the European Union have publicly criticised Israel and called for a renunciation of the illegal occupation policy. Neither political pressure nor direct negotiations led to remarkable results. Results, however, are urgently needed due to the far-reaching and lasting consequences of the current policy. Therefore, tougher measures should be taken to push for a change: the repeated demolition of EU-financed houses, the negative effects of current policies on EU-financed education projects and their consequences for the Israeli-Palestinian peace process require political and economic action against Israel. The interdependent economic and political sectors provide the EU with a powerful instrument and great leverage. The EU is Israel's largest trading partner, while Israel is only in 24th place from anEU perspective. Israel also has close ties with the EU outside economic bandwidths, for example through access to educational programmes such as Erasmus +, the Horizon 2020 programme or its participation in the UEFA and the UEFA Champions League. Consequences that restrict Israeli access to the European market or endanger cultural interdependence between the two societies could have serious consequences for the Israeli economy, but also for Israeli society. It seems that only such consequences could turn Israel around. This turnaround is more necessary than ever because the occupation and settlement policies of the Netanyahu government are significantly affecting the education system. That is why such measures must be adopted - on the one hand to realize the planned projects, but above all to maintain the vision of a self-determined Palestine. An independent and freely developing education sector is a basic prerequisite, because education is a central factor in the emergence and development of every society - also in Palestine. So far, however, it seems that the EU is following the narrative of current international politics, where financial aid is rather given to seek influence or to quieten one’s conscience, but not for actual change or to support the right to self-determination. If this narrative continues to dominate the political sphere, the burden to fight the occupation and to grant the right to education will remain on the shoulders of international activists, NGOs, and, above all, on the Palestinians themselves. Either way, it will be crucial to preserve existing and to build new educational facilities in order to create capacities for self-determination – at present and for future generations.